A unique camera that can capture a detailed micron-resolution image from a distance uses a laser and techniques that borrow from holography, microscopy and “Matrix”-style bullet time. A prototype built and tested by engineers at Rice and Northwestern universities reads a spot illuminated by a laser and captures the “speckle” pattern with a camera sensor. Raw data from dozens of camera positions is fed to a computer program that interprets it and constructs a high-resolution image. The system known as SAVI – for “Synthetic Apertures for long-range, subdiffraction-limited Visible Imaging” — doesn’t need a long lens to take a picture of a faraway object. The prototype only works with coherent illumination sources such as lasers, but Ashok Veeraraghavan, a Rice assistant professor of electrical and computer engineering, said it’s a step toward a SAVI camera array for use in visible light. 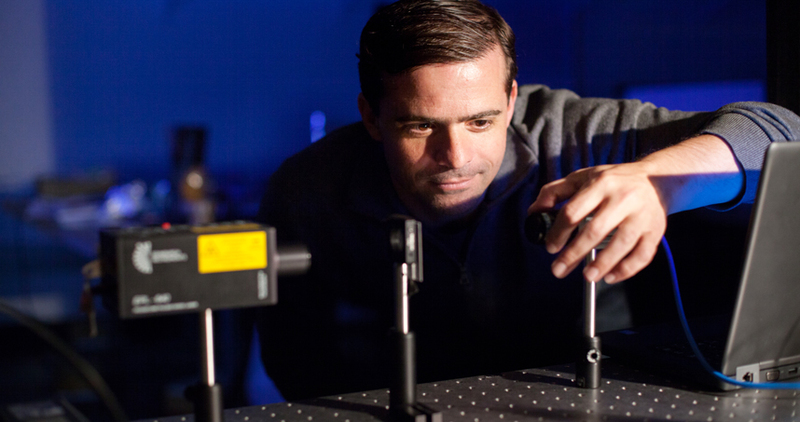 Labs led by Veeraraghavan at Rice and Oliver Cossairt at Northwestern’s McCormick School of Engineering built and tested the device that compares interference patterns between multiple speckled images. Like the technique used to achieve the “Matrix” special effect, the images are taken from slightly different angles, but with one camera that is moved between shots instead of many fired in sequence. Veeraraghavan explained the speckles serve as reference beams and essentially replace one of the two beams used to create holograms. 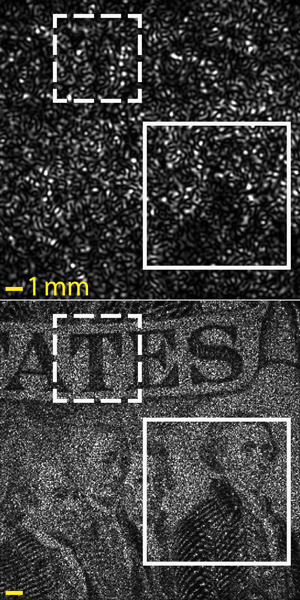 When a laser illuminates a rough surface, the viewer sees grain-like speckles in the dot. That’s because some of the returning light scattered from points on the surface has farther to go and throws the collective wave out of phase. The texture of a piece of paper – or even a fingerprint – is enough to cause the effect. “The problem we’re solving is that no matter what wavelength of light you use, the resolution of the image – the smallest feature you can resolve in a scene – depends upon this fundamental quantity called the diffraction limit, which scales linearly with the size of your aperture,” Veeraraghavan said. “By moving aberration estimation and correction out to computation, we can create a compact device that gives us the same surface area as the lens we want without the size, weight, volume and cost,” said Cossairt, an assistant professor of electrical engineering and computer science at Northwestern. Lead author Jason Holloway, a Rice alumnus who is now a postdoctoral researcher at Columbia University, suggested an array of inexpensive sensors and plastic lenses that cost a few dollars each may someday replace traditional telephoto lenses that cost more than $100,000. “We should be able to capture that exact same performance but at orders-of-magnitude lower cost,” he said. The SAVI team’s breakthrough was the discovery that it could put the light source on the same side as the camera rather than behind the target, as in transmission microscopy, Cossairt said. He spent three months at Rice to develop the system with Holloway and others in Veeraraghavan’s lab. “We started by making a larger version of their microscope, but SAVI has additional technical challenges. Solving those is what this paper is about,” Veeraraghavan said. Co-authors are graduate students Yicheng Wu of Rice and Northwestern alumnus Manoj Sharma, now a research scientist at Rice. The NSF, the Office of Naval Research and a Northwestern University McCormick Catalyst grant supported the research.